This site was submitted by Teck Seng Chan. This site uses material design graphics for the hero section and CTA’s in branded colors of blue, green, and orange. The text, buttons, and CTA’s match the branded colors throughout the site. I especially like the blurbs with the graphics. They include shadow effects and a styled bottom border. Another section shows a website design with a mobile design over it in true parallax. The site keeps the layout simple and clean while making great use of color and white space. This site was submitted by Robby Doyle. The site uses bold reds, large gray icons, and lots of white space to create a dramatic design that pops. The CTA’s are easy to spot. I like the section under the hero image that shows four columns with a divider with a title. Hovering over one reveals the links for that topic. Testimonials are shown in a slider with a photo within a shield cutout design. It displays the main point in a large gray text above the full quote. I also like the use of blue-gray in the contact form, certification icons, and footer. The certification icons display in color on hover. This site was submitted by Janus Lock. The site displays a full-screen video with a dark blue overlay on one side and a large tagline in the center. The dark blue is used with gray for the branding. A slim vertical menu remains on the right side. It also includes the tagline, but in vertical text. It’s animated on hover and expands to the full screen when clicked to reveal links and a prominent search feature over a dark blue background. Services are shown with animated graphics. The individual blocks create a box. Each one will zoom on hover and links to the sample projects. The events section creates a unique calendar design with links. This site was submitted by Kristy Hill. A slider displays the product, CTA’s, and social follow icons in the center of the hero section with a bold border and a box shadow. Green, orange, and yellow are used for the branded colors throughout the design. Featured deals are shown as products within a shop section with box shadows over a dark orange background. I love the section on how it works. It shows a large hand-drawn map that walks you through the process. The Shop the Deals page shows deals as filterable projects. The Download the App page is interesting. It shows the product on a mobile phone. As you scroll, the foreground scrolls over the screen in parallax to show the menu. This site was submitted by Juan Pablo Parody. This one displays a full-width background image with some interesting blocks of color patterns in the foreground to create a CTA. The colors are the branded blue hues that are used throughout the website. Scrolling shows alternating sections of images and text. The text is placed over backgrounds of various colors and blend perfectly with the site’s design. I also like the contact section in the footer. It shows a full-width image with the subject on the left and a block of color on the right that contains all of the contact information and social follow links. The site makes great use of large text. This site was submitted by Kelsey Specter. This site has a lot going on in the landing screen, but it does it in a clean way that works. A full-screen background image places the subject in the center. On both sides of the screen are different types of information provided as text. On the left is the navigation menu. On the right is a CTA. At the bottom is the navigation menu. This menu sticks to the top as you scroll. The layout uses a lot of white space with images and overlapping boxes (of solid color or colored borders) with text. Several of them have graphics that overlap. A large quote adds an extra element of white space. I love the hand-written fonts used in this site and the site makes great use of photography. This site was submitted by Steve Doig. It uses a thin style of text with bold colors and lots of white space in the layout to create a clean design. The hero section shows an image to one side with a tagline and CTA on the other. Just under this is a list of links to create a styled menu to the types of services offered. Each link is separated by a verticle line to match the site’s branding. CTA’s for the services show images for the various types of services with a button to learn more. These sections alternate down the page. This site has an interesting footer that has a light gray background with links in a large text. The first word of the text is a styled version of the logo, each with a different color. I like the social icon in the menu. This site was submitted by Agustina Ouvina. This site displays a full-width slider. Each slide shows background images of the products in parallax, a large search box in the center, a CTA link in the bottom left, and social icons in the bottom right. A section of featured products shows the products in four columns. Each product image shows the title and social sharing links on hover. A section showing the plans displays blurbs over the products in a blue background in parallax. I like the section on featured categories. They’re displayed as vector icons in a grid over a purple background with hover effects. A large search box appears in the menu as you scroll. This site was submitted by Ricky Lionetti. This is a one-page design that uses solid color backgrounds throughout the site. The green is also used for text throughout the site. The hero section shows a tagline in a styled text with a link to the portfolio. A large graphic overlaps the next section. An About section shows a circled image and a CTA. Under this is an interesting section that tells more about the site owner using hashtags. Current projects are displayed in a slider followed by recent projects with images and links. Sample logos are shown as images in a grid. The contact form is displayed over a cup of coffee (mmm, coffee…) and includes selections to indicate the types of services you’re interested in. I love the colors on this site. That’s our 10 best community Divi website submissions for the month of March. These sites look amazing and as always we want to thank everyone for your submissions! I am surprised you keep showcasing sites that are not https. There are three here and one is ishop which has a link to download app. How can I suggest my website I created using DIVI? Do you have an email address where can I send the address to look at? It is mentioned at the end of the article. 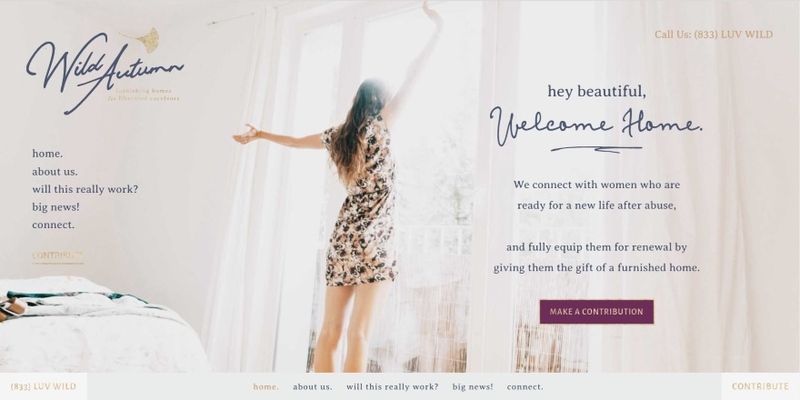 To start, these Divi website examples always seem to spark new ideas for what I can do on my sites using the Divi theme. No doubt, they are always very much appreciated! Just a thought: It would be really cool to see ratings of each site based on page speed, SEO optimization, and mobile usability of these sites (like on a 1-10 scale). *Certainly, pretty designs are cute & all but if your Divi site isn’t making you money, what is the point really? (sorry for alienating half of your user-base but some people could really use a wake-up call). As a whole, I’ve used the Divi theme for nearly 5 years now and just finally (within the past 3 months) found the perfect combo of plugins & theme mods to really maximize Divi’s potential as a serious SEO juggernaut. Granted, it was extremely tough to find reliable whitehat resources on how to properly configure Divi for SEO purposes. Not that the blog doesn’t cover it from time to time, but SEO/page speed/UX should be more central to what you guys are building (your content is already great, why not make it even better). Nonetheless, we love what you guys are doing and how talented your team is over at Divi. Keep up the great work! I really interested in your approach with this. This has been something that has concerned me as well. Especially the website loading speed. Which, no matter what I do with Divi, is always slower. A developer I sometimes use, who builds website from scratch was talking about how Divi has to load everything, which makes it all slow. Where his websites only load what they have to, making it much much faster. The SEO aspect has been concerning me as well. Yoast is a powerful tool, and doesn’t seem to always work with Divi. Doesn’t always pick up the content or the key words within the text. Divi has done a great job providing a platform to create gorgeous websites, not lets make them faster and with better ranking. I would love to pic your brain on this Andre. Reach out to me at the link attached to my name here if you are interested. I did a scan of the vexels site to see what plugin they use for the custom shirts and it came back as negative for WP… hmmmmmmm…. However… Just curious.. I can’t seem to find the regular divi code for Vexels? I’m not sure why it’s on the list? Definitely not Divi and I don’t even think its WordPress. Not sure what they’re trying to pull here, good eye. Same thing, looked at the code, we are being lied to. Great list and thanks for the inspiration! However, i know vexel and i was VERY surprised that it was in the list, i just checked up on it because i could not at all see any sign of divi, and it seems like there aint any… not even wordpress??? excuse me but compared to what divi offers for some time, there is nothing exceptional in these websites.